Canadian artist and St. Louis native Aislinn Thomas wants to take your memories of the solar eclipse and turn them into art. She is creating a multi-sensory installation — using the voices of people sharing their stories, audio of the "oohs" and "ahhs," and video of the event to document its totality in all its glory. And by contributing, you could impact the form her work takes. “The precise shape the artwork will take will be formed by the memories that people share and the process of collecting them,” Thomas explains. 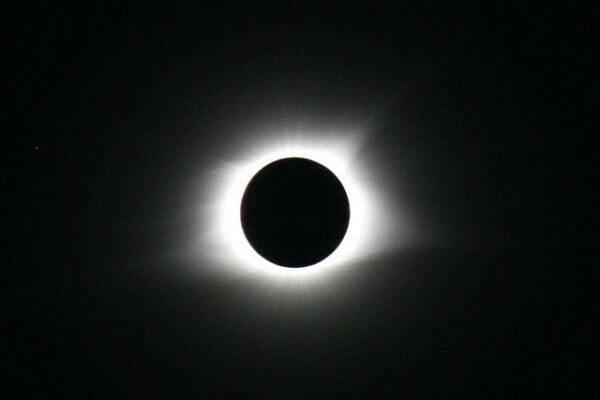 Last August, of course, the Great American Eclipse created a swath of total darkness that moved from Oregon to South Carolina as the moon blocked the sun from view, the first total eclipse to sweep across the continental U.S. in 38 years. It brought many eclipse chasers to the St. Louis area, as the Gateway City was one of the bigger cities closest to the path of totality. Thomas was one of those — though she barely made it. Thomas' mother grew up in University City and Creve Coeur, and the artist says she considers her grandmother’s house there her second home. But due to a concussion she suffered after a bike accident she suffered in 2014, she finds it hard to fly in from Canada to visit very often. Still, she made it — and she and her partner got to witness the complete totality just about an hour outside St. Louis at Washington State Park, which is fourteen miles from Potosi. Not only that, but she also didn’t bring anything to document the event on her own — not a camera, not a recorder. All she has is her memories. But that gave her an idea. She wanted to have others recall the event, using their memories to make art. “Memory is an interesting thing, how it can change over time. I’ve had a strong desire to hear other people’s memories, to try and keep the experience vital and alive,” Thomas writes. Thomas’ project is going to be included in “The brain is wider than the sky,” an exhibit curated by Ontario-based Kitchener-Waterloo Art Gallery (KWAG) Senior Curator Crystal Mowry. She says it will be on view in the summer of 2018. Thomas says she wants her project to capture the sublimity of the solar eclipse experience. “On August 21, 2017, people of all walks of life across the United States were treated to a truly sublime and multi-sensory experience at their doorstep,” Thomas said. “There should be a record of that." her past projects on her website.